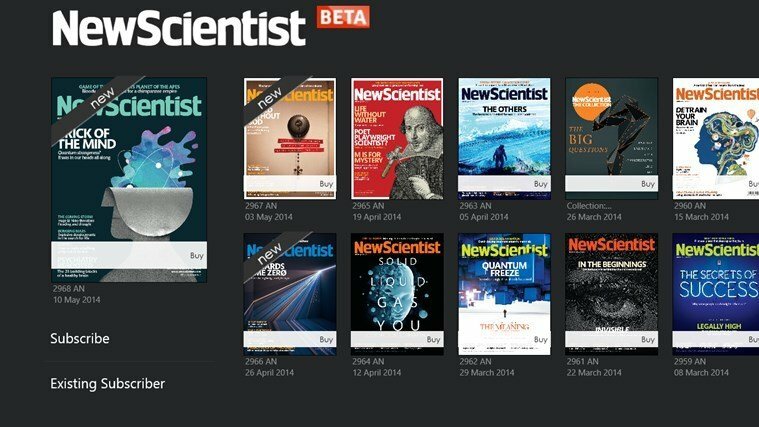 New Scientist is one of the most ready science and technology magazines in the world, and as physical print is slowly fading away, the release of their official Windows 8 app is much welcome. A fresh release, the New Scientist magazine app for Windows 8 is still in BETA, so there might be a few bugs here and there, so give it time as a future update will most likely take care of that. By using the app, you will be able to receive each week’s latest issue before it is actually available in physical stores. Also, you can easily handle and keep all of your issues in one place, so your Windows 8 tablet can become a real book holder. Besides the above mentioned features, the magazine also comes with videos and stunning images, besides the bare text. Also, you can find out more information about your favourite subjects with the help of links to references and more information. – Accurate, easy-to-understand coverage of the latest discoveries – and what they will mean for your life. – A fresh, rational perspective on international news, from healthcare to energy. – In-depth features that explore the big questions about life, the universe and what it means to be human. The New Scientist app allows you to read each weekly issue on your Windows 8 device, including in-depth articles, videos and links to references. Download the New Scientist app and read sample issues for free, buy individual issues or buy a subscription. Of course, you can download the app for free and you can even enjoy some sample issues gratis, but you’ll need to pay for monthly subscription or individual issues. Also, the subscriptions that you pay for will only work with the Windows 8 New Scientist app and not with the web portal or other apps, for that matter.